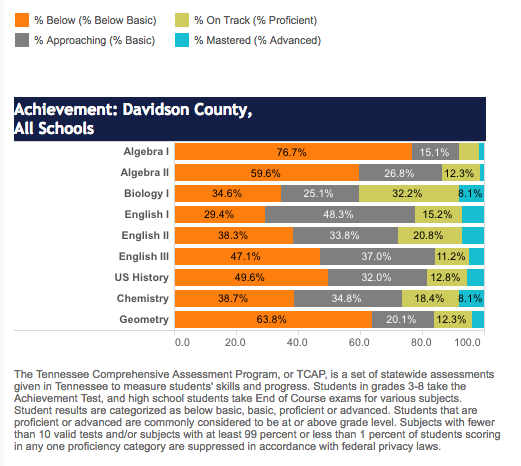 As reported earlier, the Nashville Chamber of Commerce released its education report card today. Board member Amy Frogge did not attend the event and offered an explanation as well as some comments on why she supported the proposed moratorium on expansion of charter schools. The moratorium proposal was pulled from the agenda at last week’s meeting. Today is the presentation of the Nashville Chamber of Commerce’s Education Report Card. I have not attended this event for the last two years and will not attend today. I was actually considering attending this year (it’s a new day in Nashville with a new Director of Schools), but Chamber leaders were up to their old tricks at our school board meeting last week, which left a bad taste in my mouth. Their actions demonstrated, once again, that their first priority is not the health of our school system, which is why I will not attend today’s presentation. When I first decided to run for school board back in 2012, I contacted several people to learn more about the work. I spoke with a minister who formerly served on the board, and one of her first comments to me was: “I am very concerned about the influence of the Nashville Chamber on education in Nashville.” I was perplexed by this remark and wondered why business executives might have a negative influence on public education. I soon learned. I have since been warned about the Chamber’s influence over the board by several other leaders in the city. What Chamber leaders chose to do last week is a good example of why I have lost respect for their work. The school board was scheduled to vote on a charter school moratorium. It was absolutely the right thing to do, given the facts (which I will detail below), but then the Chamber got involved. Chamber leaders like to use their powerful connections to twist arms behind the scenes, and they also started a campaign for more charter schools. This was not a grassroots campaign. Instead, the Chamber managed to generate a number of emails to the board opposing the moratorium from people in places like Brentwood, Mt. Juliet, Murfreesboro, and even Claremont, California. The emails came from affluent folks who obviously don’t have children in local schools, who likely don’t even utilize public schools, and who most certainly don’t send their children to charter schools. So what’s this all about? In part, it’s about education for “those” children (something quite different than the education they expect for their own children). However, the primary impetus for these emails is quite simple: Chamber leaders want more charter schools that will drain money from public schools to financially benefit their wealthy friends. Expanding charter schools has been the Chamber’s number one focus since I’ve been on the board. While I’m all for school partnerships and I do appreciate the business partners the Chamber has brought in to support our high schools, Chamber leaders repeatedly overstep their bounds by trying to set the agenda for the school board. There have certainly been some good folks involved on the Report Card committee who do support public education, but their voices are drowned out by those who are more interested in profit for their rich friends. Top level Chamber leaders have worked hard to control the school board for many years, and they do not seem to recognize that we are duly elected representatives who answer to the public, not them. These folks are used to running things in Nashville, and they expect school board members to hop to. In my own interviews with Chamber leadership, I’ve been arrogantly lectured, told that school board members should never go into the schools, and admonished that I don’t understand the role of the school board (which apparently should be to cater to the elite). I was so annoyed by these interactions that I finally quit going to Chamber interviews and did not seek their support during this last election cycle. I do not work for the Chamber, and I will not be controlled by the wealthy and powerful. If Nashville Chamber leaders truly care about our students, they should promote fiscally responsible policies. They would also do well to start trying to work with- and not against- the school board and the Director of Schools. Great partnerships happen when each partner respects and values the role and viewpoint of others. Here are the remarks that I planned to share at our last school board meeting before the moratorium was pulled from consideration. I hope Chamber leaders read this and take note. “Currently, there are 1,128 children on wait lists for charter schools in Nashville. Our charter schools currently serve 10.529 students, but by year 2021, the projected enrollment for charters is 18,365, which comprises a 74% increase. That means that even if we don’t approve another single charter school in Nashville, the number of charter seats will nearly double in five years. In contrast, there are 5,433 students on wait lists for optional schools in Nashville, including both traditional schools and magnet schools. The wait list for one school alone, Meigs magnet school- at 816 students- is nearly as high as the combined wait lists for all charter schools in the city. And if we are truly interested in responding to parent demand, it would make sense to consider opening another Montessori school, because there are nearly 600 students on the wait list for Stanford, one of the city’s two public Montessori options. Also of note: there are 2,389 students on wait lists for preschool and pre-k programs across the city. It’s important to acknowledge that this extensive wait list includes only children under 6 years of age. There is obviously a huge demand for more pre-k seats, more than double the demand for charter seats. So while there’s been a well-funded marketing campaign for increased ‘choice’ by the charter sector and a great deal of our tax dollars spent on charter marketing to families, the data paints a very different picture about parent demand. There is simply no demand for more charter school seats in Nashville. The already approved growth of our existing charters schools greatly eclipses any wait lists for charter school seats. Unfortunately, we have failed to set a clear direction for charter growth in our city. The lack of planning for controlled charter school growth can lead to disastrous outcomes for school districts. In 2013, Detroit schools filed for bankruptcy, and this past June, the state of Michigan had to pay $617 million to bail out the Detroit school system, which was facing bankruptcy again and couldn’t even afford to pay its own staff. Detroit has the biggest share of students enrolled in charter schools than any other city in the US, with the exception of New Orleans, and Detroit has been on the forefront of charter school expansion. Its approach to education, which is based on school competition, has been described as ‘the Hunger Games for schools.’ Philadelphia is another case in point. Philadelphia schools have been plagued by persistent budget deficits, according to a recent audit, which have been attributed largely to charter school growth in the city. As one source summarized, ‘The influence of charter schools mixed with funding cuts for traditional schools combine for a perfect storm of financial distress.’ Similarly, two years ago, Shelby County Schools in Memphis reported a $157 million deficit, which school leaders attributed largely to the explosive growth of charter schools in the city, many imposed upon the district by the state’s Achievement School District. Last year’s shortfall was $125 million, and this year’s deficit is $86 million. The deficit is decreasing because Memphis is closing neighborhood schools to address debt created by the expansion of charters schools in the city. These stories are not scare tactics; they are lessons for us to learn, and we would be wise to pay attention and take heed of how the growth of charter schools is impacting other school districts around the country. And if we need further evidence of the problem, Moody’s Investors Service, which rates the fiscal health of local governments including Nashville, has warned that ‘charter schools pose growing risks for urban public schools’ and noted that ‘a city that begins to lose students to a charter school can be forced to weaken educational programs’ in traditional public schools. Here in Nashville, we have been warned. Two independent studies of our school system concluded that ‘charter schools will – with nearly 100 percent certainty – have a negative fiscal impact on Metro Schools.’ We cannot rob the schools that serve 90% of our students to feed the charter schools that serve only 10%. Every student deserves a great education, and if we support some students at the expense of others, we have created a major equity problem. It’s particularly baffling to me that we would risk placing our school system at risk when there’s no demand for more charter schools and no plan to pay for them. And then there’s the question of whether we are really improving outcomes for students by increasing school choice, via charter schools, within our district. Research on the impact of school choice on student learning generally shows mixed results with studies typically showing little or no difference in overall performance compared to traditional public schools. As this board moves forward in partnership with a new administration, we would be wise to create a strong strategic plan that positively impacts all students. We have allowed the charter sector to create its own vision for growth in Nashville, a duty that should instead fall squarely on the board’s shoulders. The board should set clear parameters for charter growth, decide what programs we could implement to benefit the majority of students, and what investments we must make to ultimately improve our outcomes. We cannot continue to open more and more schools, willy nilly, with no clear vision of how they will serve our needs or impact other schools and students. And we would be foolish to ignore the ample warnings we’re received indicating that charter growth could very well place our already underfunded district in financial distress. The Nashville Area Chamber of Commerce today released its annual Education Report Card for MNPS today. The graduation rate, which measures the percentage of all students who graduate from high school within four years, plus a summer period, fell from 81.6 percent in 2015 to 81 percent in 2016. The number of MNPS students taking the ACT increased by 586 students in 2016, while the percentage of those scoring at least a 21 dropped from 30 percent in 2015 to 28 percent in 2016. Based on these limited results, we must conclude that MNPS did not record overall improvement during 2015- 2016 – for the second year in a row. With a new director of schools and executive team in place for the 2016-2017 school year, there is an expectation in the community for MNPS to resume a faster pace of improvement. 1. Metro Schools should expand its commitment to school-based budgeting to ensure equitable access to resources across all schools. 2. 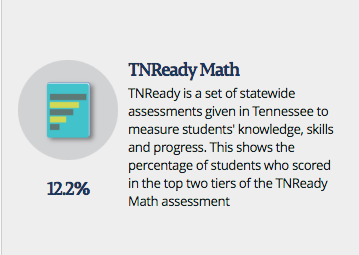 The State of Tennessee should incorporate measures of both career and college readiness into the new school and district accountability system. 3. Metro Schools should ensure that its early-grade teachers have demonstrated expertise in literacy instruction. 4. 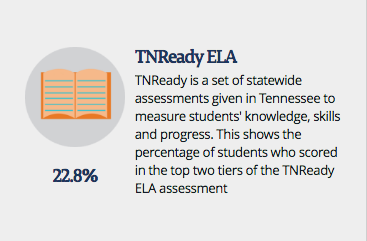 Metro Schools should measure each school’s implementation of the district’s literacy initiatives to ensure fidelity. 5. Metro Schools should engage community partners in developing a citywide plan and timeline to ensure early-grade (K-2) literacy by May 2017. For more details on the findings used to reach the recommendations, read the full report.